If you find that you're too late for the main cherry blossoms, you might still be in luck with the Kwanzan cherry blossoms. They bloom a little later. There are fewer of the Kwanzans, but they're very pretty. The most famous, oldest, and numerous, around the Tidal Basin and East Potomac Park/Hains Point are the Yoshino cherry blossoms. There are over 1,400 of that variety around the Tidal Basin. But there's more than one type of cherry blossom, and they don't all come out at exactly the same time. Around the Tidal Basin alone there are another 10 varieties of cherry tree. The Kwanzan cherry blossoms are particularly pretty and typically come out a couple of weeks after the Yoshinos. Their average peak bloom date is around April 22, and the historical average (going back nearly a century) is that they reach peak bloom 15 days after the Yoshinos reach peak bloom. It does vary year to year, though, and sometimes it has been as little as 4 days later, while other times up to a month. So if you miss the end of the Yoshino cherry blossoms' bloom, the Kwanzans can offer a very pretty consolation. They have a much darker pink, multilayered flower that looks a bit like a small rose. The trees themselves are quite low to the ground, so they're especially good for getting a close look at the flowers (or for posing next to in photos). And there are also far fewer people crowding around them. Kwanzans are actually quite common in the region, and you'll notice them all over the place once you start looking. They can even in the most unlikely of places--there are actually quite a lot lining the I-66 highway, for instance--and they're popular in residential neighborhoods. 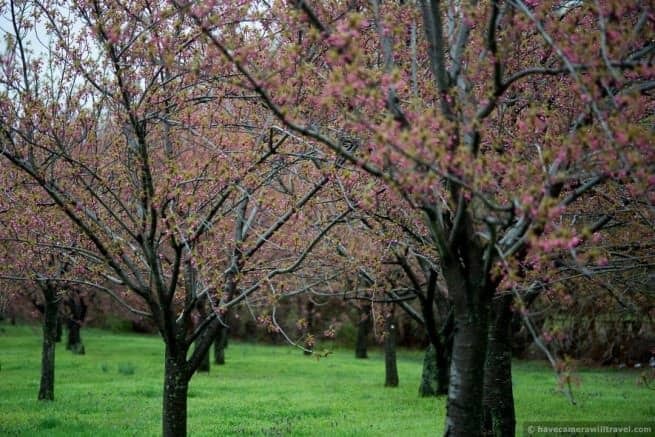 If you're down near the Tidal Basin, there's over 400 Kwanzan cherry trees split between a large grove and some smaller groves on Hains Point/East Potomac Park. They're on the side that's opposite the airport, next to the golf course. If you do the one-way circuit around the tip of Hains Point on Ohio Drive you'll see a long grove of them on your right and then another small grove at the intersection with Buckeye Drive near the US Park Police Headquarters. If you're heading down to take photos of the ones next to East Potomac Park, they get the afternoon sun but are in the shade in the early morning. There are parking spots right next to them, and there are rarely many people about. If you're after morning sunlight, there are a half dozen or so next to the playing field in West Potomac Park along the bend of West Basin Drive. There are also about 44 Kwanzan cherry trees around the Tidal Basin interspersed with the others. Here are the historical peak bloom dates for the Kwanzan Cherry Blossoms. The data published by the NPS on this is incomplete, but this is what's available. Based on this data, the Kwanzans reach peak bloom on average 15 days after the Yoshinos, but as you can see there is wide variation--sometimes it has been as little as 4 days later and sometimes as much as a month. Just as with the Yoshinos, temperatures are the big factor in determining the bloom's timing. I will be out in the DC area from April 22 - April 29. Will there still be any Yoshino cherry blossoms left or will they all be gone by then? Also if they are gone, is it predicted that the Kwanzan Cherry Blossoms will be in bloom during that time? Thanks. The Yoshinos will be done by then. The timing should be good for the Kwanzans, but I haven't seen a current peak bloom forecast for them. Hi David, We plan to be there in April 6th to April 8. 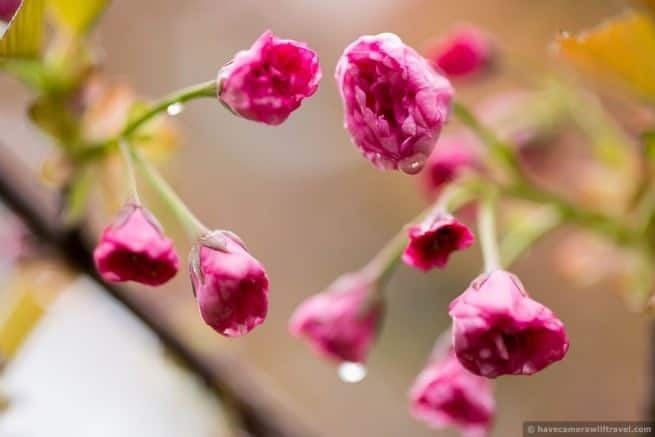 Is that still Cherry flower for us to see. 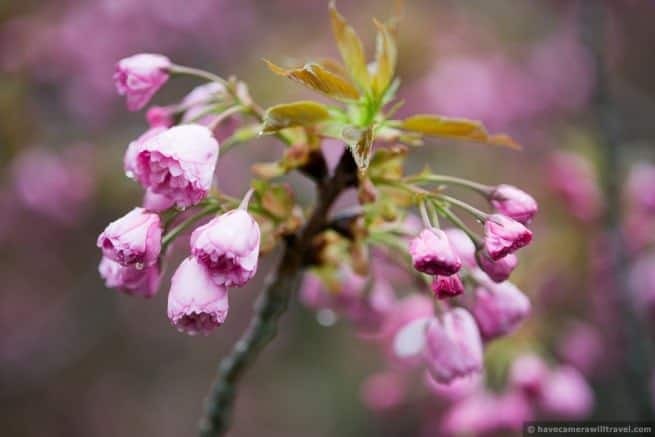 Do you have any pictures of Cherry flower after pick bloom, how much left on the trees? Your advise is greatly appreciated. Your photos so beautiful! You can find some examples of how the cherry blossoms look after peak bloom here. Hi! What are the Kwanzan predictions for 2018? Thanks! Good question. I don't know the answer but will see what I can find out. How are the kwanzan cherry blossom looking? I have some photos from a few days ago. Not much change since then. We are planning on coming to see the Kwanzans on April 11. Will the be peak then? The most recent peak bloom prediction I've heard from the NPS for them is for April 10-13. If that holds it'll be perfect timing. They tend to do things at a bit more leisurely pace than the Yoshinos and stay out a little longer, so timing isn't usually quite so critical with them. I've been checking in on them over the past few days and there's really nothing new to see since last week's update. As we get closer and start seeing some movement I'll be posting more regular updates on them. 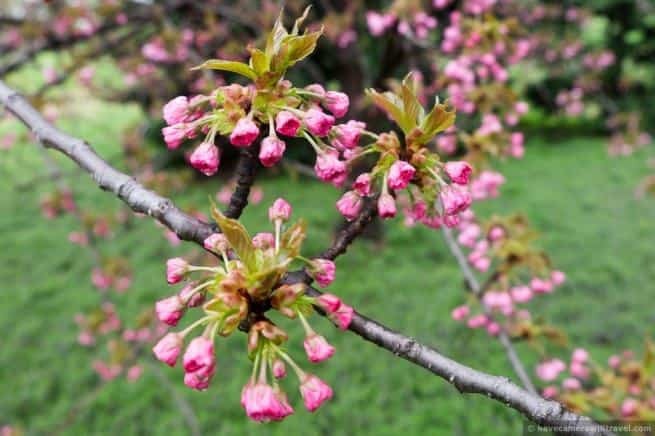 Have the Kwanzan cherry blossoms been damaged this year? No. They're still in early stages when they're much less vulnerable to the cold. Thanks so much for the reply. I know it's not quite the show that the other cherry blossoms put on, but are the Kwanzans spread out? Is there a site where I can see what they look like along the Tidal Basin? They're very pretty, though. There's a map lower down on the page that has pink marking where some of the larger clusters are. Most of them aren't directly on the banks of Tidal Basin itself, but they're nearby. Can someone give me the status on the Kwanzan Cherry's this year? What do they look like now? Are they near peak bloom? Kwanzan Cherry Trees are beginning to bloom, so expect it to peak in the next week or two. Thanks Ksu, that's a great shot! I'll have to get down there this week. Is there any parking lots in East Potomac Park to see Kwanzan cherry blossoms? or do we have to park somewhere and walk to that park? There's parking right next to both--within 50 feet or so of the trees. For the ones next to the FDR Memorial there's parking along West Basin Drive, Ohio Drive, and the parking lots under the 14th Street Bridge. For the ones next to East Potomac Park, there are parking spots all the way around Hains Point and you should have no problem pulling up right next to them. Now that the Yoshinos have finished around the Tidal Basin you won't have much problem with crowds and parking is much easier. Not sure exactly when peak bloom for them will be. The cold stretch of weather we're starting now will slow things down, and I hope to check in on them in the next day or two and will post an update. Thanks David, I read after I posted about the status of these trees. I'll await your update. Thanks! Thanks David! I really appreciate the updates. The main ones will be done, but you might catch the Kwanzan cherry blossoms. More on them here. Hi, David. If I visit this weekend (4/18 & 4/19), will these cherries be at peak blossom? Thanks much! It might be a bit on the early side by a few days. I hope to swing by them again later this week and will post some new photos. Thank you for your prompt reply, David. We will be booking a last minute flight from Denver CO just to see the blossoms, so I'm hoping to do so either this weekend or next. Would next weekend be a better choice, or will it then be too late? We missed the Yoshinos. 🙁 Your assistance is greatly appreciated. Your photos are beaauutiful! Meant to add... if you haven't already seen today's update there are some photos of the Kwanzans from this morning in it. Thanks, David. I did see the photos and read your post regarding them taking 10-14 days post Yoshino bloom. Just trying to figure out which dates to fly in to catch the Kwanzans. I'm afraid I don't follow the Kwanzans as closely and am much less familiar with their patterns. There aren't as many of them and they're a bit more out of the way a little distance from the Tidal Basin. I hope to get down there tomorrow morning to take another look. And the NPS has a list of the historic bloom dates that will at least give some idea of historical averages relative to the Yoshinos.